TunnelbearVPN Review (2019) | Get Tunnelbear Free - But is it Safe? 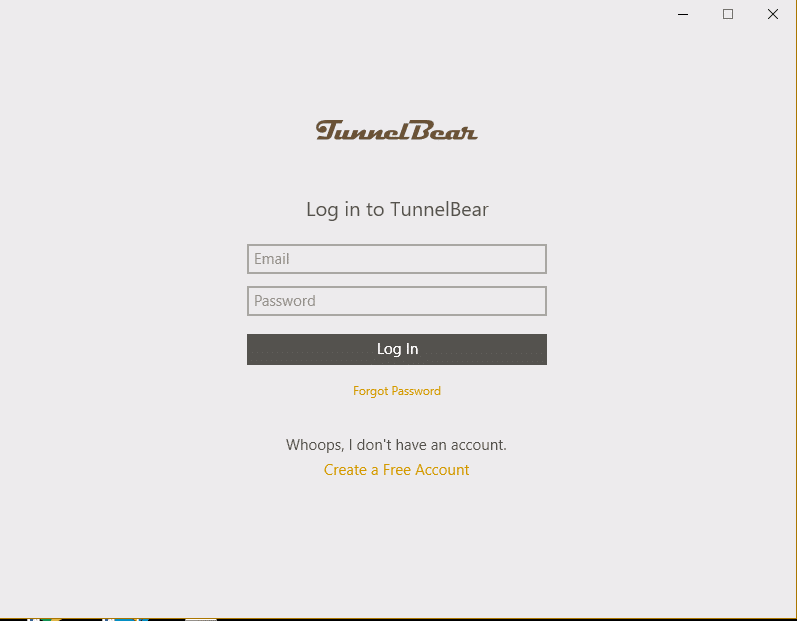 Tunnelbear Review 2019 – Is Tunnelbear Safe? Mandee Rose | Posted on February 6, 2019 February 6, 2019 | Leave a comment on Tunnelbear Review 2019 – Is Tunnelbear Safe? The service has its serious side and it has plenty of security features to keep your privacy protected on the internet. The encryption standards employed in the VPN are among the strongest in the world. The free version of TunnelBear is almost as good as the paid version. You are only allowed one connection with the free version, but you can open multiple accounts in order to give the service to all the members of your family. If you are from Australia and travel abroad, you will be miffed to learn that the only server in the TunnelBear network that isn’t available in the free version is the one in your country. The one other restriction on the free version of the VPN is that there is a monthly data throughput limit. TunnelBear has a free version and paid plan. 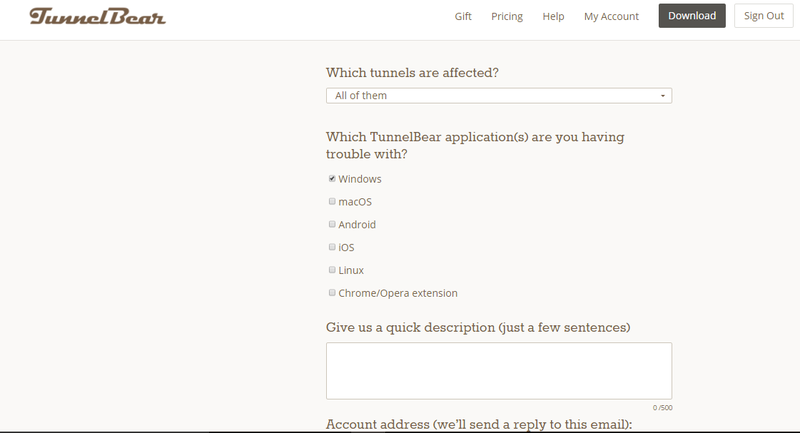 The paid TunnelBear account can be taken out as a monthly subscription or for a whole year. The longer-term plan works out cheaper when calculated on a monthly basis. In keeping with the company’s theme, all of the plans have bear-related names. 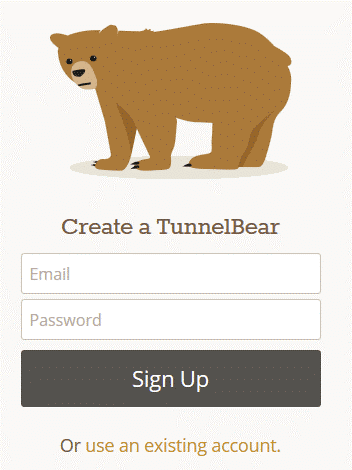 The Little Bear plan gives you almost full access to the TunnelBear service. You get 500MB of data throughput every month, which can be bumped up by 1GB if you mention the service on Twitter. Unfortunately, you can’t pay for TunnelBear with PayPal. However, the regular credit card payment options are supplemented by being able to pay with bitcoin. 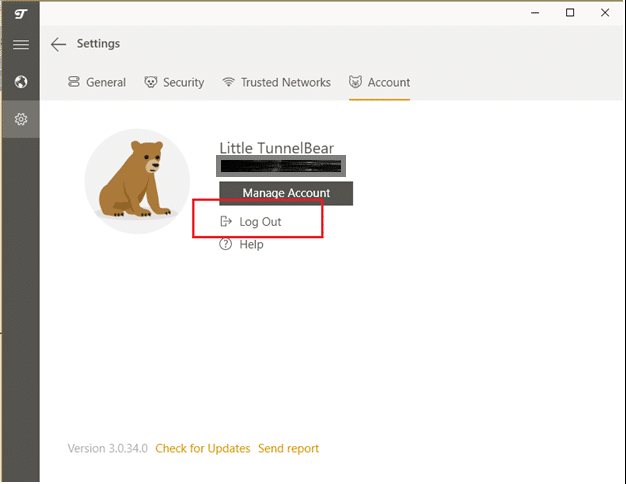 TunnelBear has a no logs policy. However, it states in its terms and conditions that the company does not condone the downloading of copyrighted material without permission, so this isn’t a service that people who want to download with P2P networks should choose. 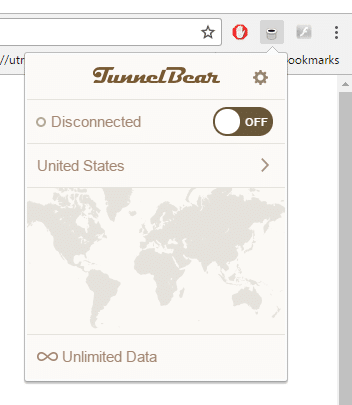 TunnelBear’s funky app is available for Windows, Mac OS, and Android with built-in OpenVPN. The version of the app for iOS uses either L2TP with IPSec or IKEv2 VPN protocols. Those iOS users who want to get OpenVPN have to download a third party app. The encryption used in the OpenVPN implementation uses Advanced Encryption Standard (AES) with a 256-bit key. This is the industry standard and is probably the strongest security around. The same encryption is used for the iOS version, except for those running iOS version 8 or earlier, where AES is implemented with a 128-bit key. A big area of concern with VPN encryption systems at the moment is the strength of security employed for key distribution. This is an issue because AES is a symmetrical key system, which means that both sides in a connection need to have the same key to both encrypt and decrypt data. Most VPNs use RSA encryption for their handshaking and key exchange. The question here is the length of the key used for these phases, because a shorter key can be cracked. TunnelBear uses a 4096-bit key, which is the strongest protection in the industry at the moment. The company’s base in Canada might worry those who are suspicious of government surveillance. Canada is part of the Five Eyes secret service network, which is not afraid to snoop on ordinary citizens. Canada is also very accessible from the United States, which means that VPN users in both of those countries might be vulnerable to court action by copyright holders. This might explain why TunnelBear tries to discourage torrent downloading with its VPN service. TunnelBear’s privacy policies adamantly state that it does not keep activity logs and so could never be put under pressure to reveal the habits of its customers. You only need to give an email address in order to sign up for the free version of the VPN, and you can create a new webmail address just for that purpose if you want to preserve your anonymity. Paying customers can always be traced through their bank details. However, you can pay for the service with bitcoin, which doesn’t require you to reveal your address. Another possible avenue for separating your identity from being traceable is to buy the service in someone else’s name and make a gift of it to yourself. The server network is not very extensive. However, it does include the major English-speaking countries. The server in Australia is the only one that isn’t included in the free version of the service. TunnelBear doesn’t offer a money-back guarantee, so it is better to try out the free version first, before you pay for the premium option. Click on the Get Started button on the TunnelBear homepage to begin. This will take you to the sign up page. You only need to give your email address and create a password to get into the service. When you click on the Sign Up button, your account will be created and you will be taken straight to the download page. If you are logged in to your account on the website, whenever you arrive at the download page the site will detect your operating system and automatically begin the download of the appropriate install file. If that doesn’t work, you can kick-start the download by pressing on the relevant button for your system. This is a great feature, but it does mean that you will get another copy of the installer when you return to the page to get the browser extension. To get the extension, click on either the Chrome button or the Opera button. The extension installation is almost instant and you can get this done while the download of the install file progresses. Clicking on the Chrome button takes you to the Chrome Web Store. You can then get the extension on your browser by clicking on the “Add to Chrome” button in this page. To continue installing the app, click on the downloaded file. 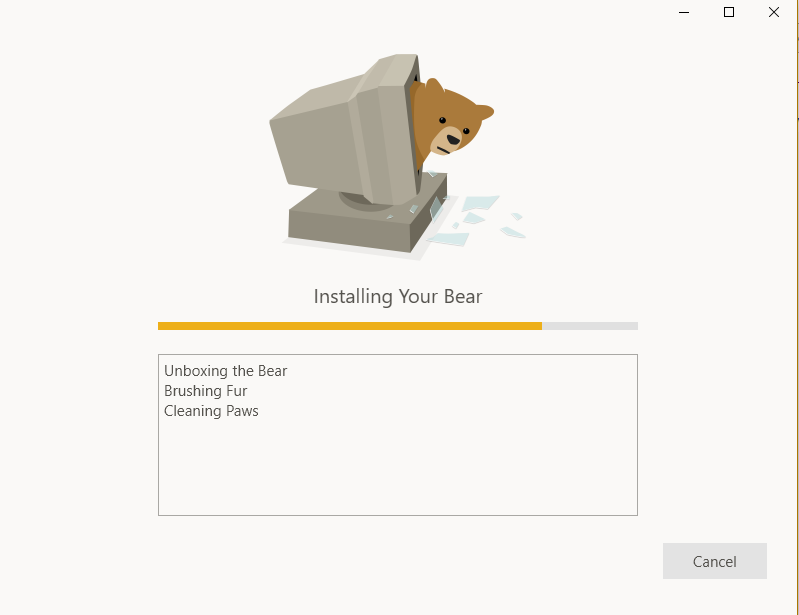 The TunnelBear installer is great fun. Rather than employing standard install wizard software, the TunnelBear team wrote their own. After agreeing to the terms of service, you will see the install procedure. The cute messages that show the progress of the install are a lot more entertaining than those used in any other VPN installation process. Look to the end of the address field at the top of your browser once you have installed the TunnelBear extension. You will see a gray honeypot. This is the icon you need for access to the service. Click on the icon to get the Interface to drop down. 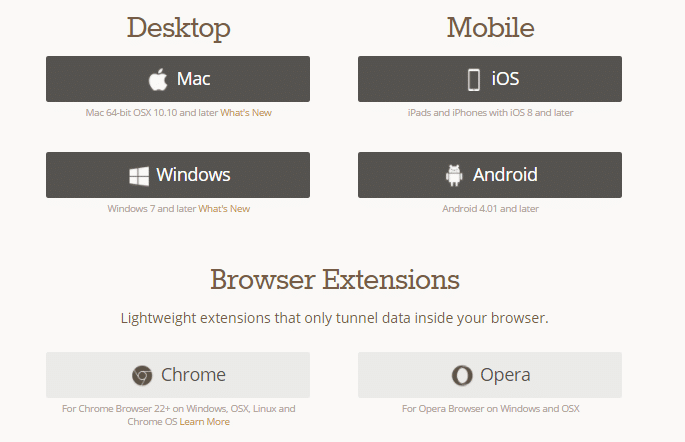 The log-in for the extension is linked to the website. 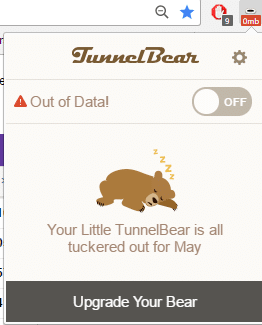 So, if you are already logged in to your account at the TunnelBear site, you are also logged in to the extension. There are almost no settings options available in the browser extension. You have a choice of server and can turn the VPN on or off. When the extension is turned on, you will see that the icon on the browser changes to show a bear popping out of the honeypot. 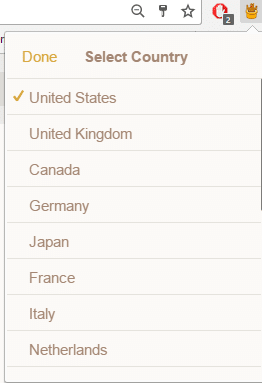 To change location, click on the server country name field. This will open up the list of available servers. Once you run through the 500MB data throughput allowance in a month, you have to wait for the next month before the extension will work again. TunnelBear sets itself to initialize when your computer starts up. If you close the app down, however, you can open it up again by clicking on its icon on your desktop. Unlike the browser extension, the log-in status of the app is separate from that of the website. You need to sign in the first time you open the app, but then your credentials are stored, so you should be signed in automatically on subsequent visits. If you don’t want to be automatically logged in every time you open the app, you can log out at the end of each session. This option is available on the Account tab of the settings page. The side menu of the app is very simple. The world symbol takes you to the main page of the app and the cog icon accesses the settings system. The hamburger menu expands the side menu width without adding any other functionality. The graphics and animation are the fun part of the app. When you open up the app, you will see your current, unprotected location represented on the world map as a sheep. This screenshot shows the free version of TunnelBear. It is exactly the same as the paid version, except that a message at the bottom of the screen shows the remaining data allowance beside a button that gives the opportunity to upgrade to the paid version. That cheeky bear isn’t seen again until he pops up in the specified location. When you turn the VPN off, the bear goes back to your location and sits in the entrance of the tunnel to await your instructions. 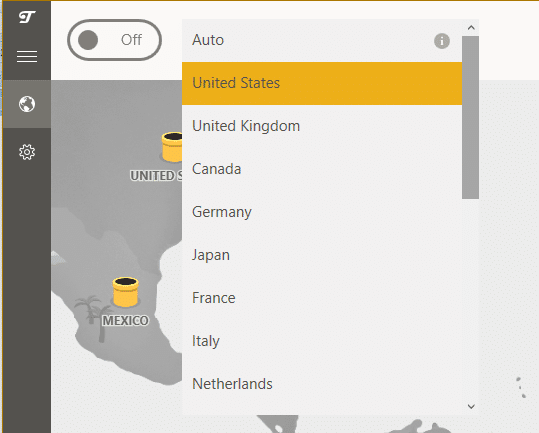 Clicking on the server country name allows you to select a server location from a drop-down list. The app is a lot more entertaining than the browser extension. However, I found that the app had a lot of problems getting connected. The browser connected a lot faster and maintained the connection. The app had to make several attempts at reconnecting before the line was secure. The support system is available back at the website. Click on the Help menu item at the top of each page in the site. The help system features a searchable knowledge base. You can contact a Support Bear by clicking on the Contact Support button. After using check boxes and radio boxes to report your problem, you will be able to write your support question. The support process then continues by email. The difference between using the app or the browser extension is that the app will channel all of the communications from your computer, whereas the extension only handles traffic over the web. The speed tests of this review use the website speedtest.net, so it is more appropriate to test performance of the VPN service through its browser extension. 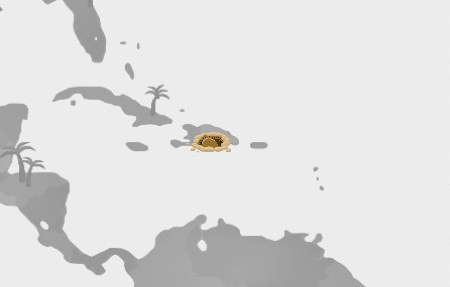 These tests were performed from a location in the Caribbean, where the regular internet service is slow. Some VPN services can greatly improve the performance of slow internet services. However, the minimum that you can expect from a VPN is that it doesn’t cripple your access speeds. Here are the standard local connection’s speeds. This acts as a baseline to the tests. Local speeds are usually between 2 Mbps and 3 Mbps. So, the internet was working well on this day. All of these results are just about good enough to stream HD video. However, most streaming services won’t let you in if you access them from abroad. This is one of the main reasons that people use VPN services. 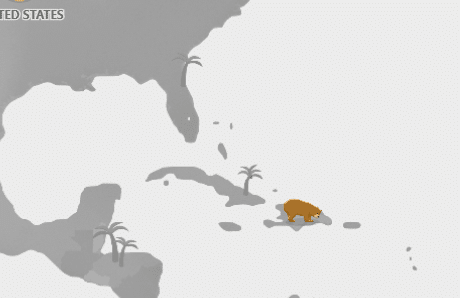 TunnelBear doesn’t let users select servers in specific cities, just the country. So, I turned on the VPN with the United States server engaged and tried the connection to Miami again. I switched to the UK TunnelBear server, and tested a connection to London. In these test results, the VPN improved the speeds slightly. However, these variations may just be down to the fluctuations of the underlying local internet service. One of the main reasons that people sign up for a VPN is to give them access to regionally restricted streaming services back in their home country when they travel or live abroad. You need connection speeds of at least 2 Mbps to watch SD streaming and at least 3 Mbps to comfortably stream an HD video. Streaming services have to comply with contract agreements from production companies that grant them the right to show content in specific countries. This is one of the reasons that streaming services lock out access over the internet from users located in other countries. Netflix has one of the most stringent controls on international access in the world. It not only checks where a request comes from, but also invests a lot of money in systems that block VPNs. Very few VPNs can get past the Netflix proxy detection system. So, while I had the UK server of TunnelBear, I logged into my Netflix account and tried to access a show. It worked. I also got into BBC iPlayer and E4 thanks to TunnelBear. With one click on the TunnelBear extension server list, I found myself in the United States. Unfortunately, Netflix in the US spotted my use of a VPN. ABC won’t usually allow you to watch its shows over the internet from abroad, so that site provided another good test of TunnelBear’s capabilities. Unfortunately, abc.com spotted the presence of a VPN and blocked access to its content. However, at NBC, I got free access to all shows. When I switched to the TunnelBear home server in Canada, I tried Netflix again. I was completely blocked from access to the website. However, I could get into cbc.ca, and watched its shows with the assistance of TunnelBear. Should I Subscribe to TunnelBear? The problem with a TunnelBear subscription is that you don’t get much more than you have with the free version. If you have kids with computers, you should definitely set up a free account for each of them. The restrictions on torrent downloading and the limit of 500 MB of throughput on that service could actually help keep your children off P2P networks and teach them the value of pacing their internet access. If you want to get into streaming services from abroad, you should certainly invest in a TunnelBear subscription… if you’re British. 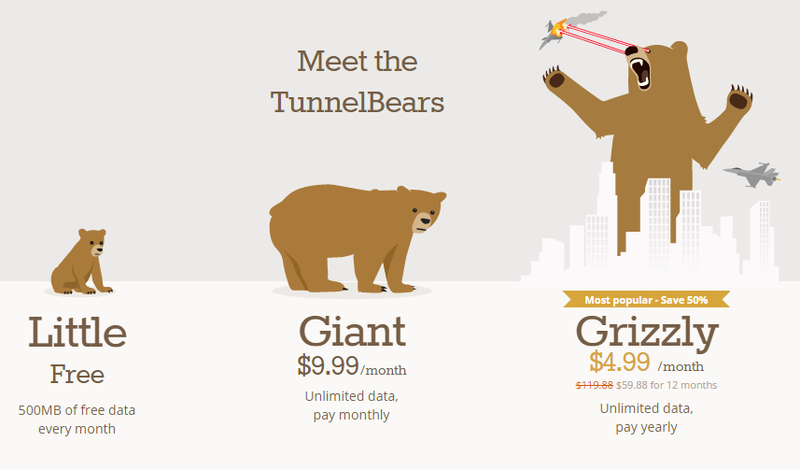 TunnelBear is an entertaining and well thought out VPN service. Everyone should have the free service installed. 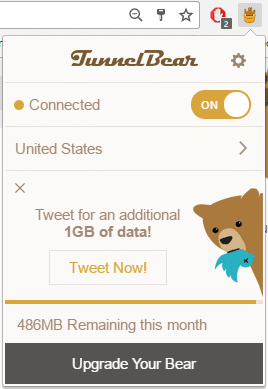 If you try the free TunnelBear and find it gives you everything you need, then you will soon run through the data throughput allowance. At that point, you should subscribe.